Fairbanks quarterback Jacob Nicol goes back to pass against Greeneview on Friday. Nicol made his season debut after injuring his knee during the preseason. The Panthers lost, 27-14. The good news on Friday night for the Fairbanks football team was that senior quarterback Jacob Nicol returned to action. The bad news was that the Panthers couldn’t generate enough offense during a 27-14 loss to Greeneview. Nicol, who had injured his knee during the preseason, took a little while to get back into a rhythm after his prolonged absence. “It was good to have Jacob back,” said FHS head coach Patrick Cotter, whose team slipped to 1-2 for the season. “He was a little rusty during the first half, but he played better during the second half and the offensive line protected him. Nicol completed 16-of-27 passes for 166 yards. He wasn’t afraid to take the ball into the line, either, as he was FHS’ top ball carrier with 75 yards on 11 carries. The Panther defense stopped the Rams during the game’s first possession when Gatlin Luke intercepted a pass from Greeneview QB Nick Clevenger. Fairbanks couldn’t move the ball and was forced to punt. The Rams began their second series at their own 23 and marched all the way down to the FHS 19. The drive stalled, but Jon Brakeall booted a field goal that gave Greeneview a 3-0 lead. After an exchange of punts, the Panthers mounted the first of their two scoring drives. FHS began with a short field at the Ram 33-yard-line after a punt. Mason Cushman picked up three yards before Nicol connected with Braeden Fairchild on a pass down to the two. Cushman picked up one hard-earned yard and Nicol finished the series with a plunge into the end zone. Cade Ziegler booted the extra point for a 7-3 lead. The Panthers could not capitalize on that brief momentum as action moved into the second quarter. The Rams scored four plays into the new period when Taylor Stinson found a seam in the FHS defense. He sprinted 41 yards for the touchdown that returned the lead to the visitors. Brakeall’s conversion gave the Rams a 10-7 lead. Fairbanks drove into Greeneview territory, but eventually lost the ball on downs. The Rams moved to the FHS 45 on a pass from Clevenger to Ian Tamplin. An ineligible receiver infraction momentarily halted Greeneview’s momentum and put the ball back at the Rams’ 45. Clay Payton took the handoff from Clevenger and covered the remaining real estate on one play. Brakeall’s PAT pushed the Rams out to a 17-7 lead with seven minutes left in the half. The combatants swapped possessions over the next few minutes. One of Greeneview’s series ended on an interception by Fairbanks’ Charlie Scheiderer. The Panthers could not generate much in the way of offense and turned the ball over with 2:33 left until the break. The Rams put together one final scoring drive and tacked six more points on the board with 28 ticks left on the timer. Clevenger connected with Tamplin on a pass that covered 42 yards into the end zone. Brakeall’s point-after sent the Rams into the turn with a 24-7 lead. While Nicol looked more sharp after the break, the Panthers remained strangers to the end zone. One possession ended when Braxton Wilhelm, the holder on a field goal attempt by Ziegler, was tackled for a loss. That turned the pigskin back over to the Rams. Another potential FHS scoring drive was thwarted when a Nicol pass into the end zone was dropped by a receiver. The score remained the same at 24-7 as the fourth quarter began. Greeneview’s final points came on Brakeall’s 31-yard field goal after a 16-play series. 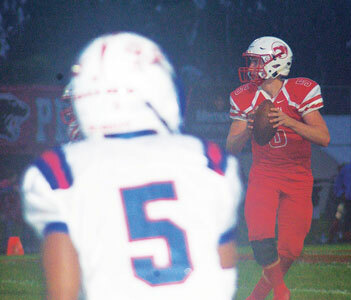 The Panthers, who will travel to Madison Plains on Friday, scored a late consolation touchdown when Nicol found Tyler Beem in the end zone from seven yards out. Ziegler’s extra point concluded the drive. “We moved the ball better during the second half,” said Cotter. “However, a couple of penalties and that dropped pass in the end zone hurt us. “I thought our defense held them pretty well during the second half, but we just couldn’t get off the field during their final series (when Greeneview kicked its second field goal).